Archives of Eaton Bray News for September 2009. This article was published in September 2009. Please see Latest News for more recent information. A Sunday brunch has raised more than £750 for charity - and Barclays Bank has matched that pound for pound to double the total. Eaton Bray villager Sally Siddons, a former Barclays employee, organised the event, attended by more than 60 people. The cash was raised for Iain Rennie Hospice At Home, a charity which helped Sally's mother and some close friends at the end of their lives. Barclays gave a contribution as part of its community investment programme pound for pound matched funding scheme. Beryl Bishop, a volunteer Iain Rennie nurse, said: "The day was a great success. I really enjoyed the event. It was hard work, but a lot of fun, and it is great to raise so much money for such a good cause." Strikes from James Hurley and Chris McGee lent promise to the initial phases of this encounter but it was Langford who scored first, managing to poke through the otherwise rigid defence of Adam Bradley, Tom Horner, Jake Draper, Ben Roberts and MOM Aarin Johnson. They would land second before the close of the half, but James Hurley gave the visitors hope, heading in with minutes left. Keeper Dan Kennell pulled off some impressive saves, drawing applause from supporters on both sides. Once again though Lions' worrying propensity for easing off when behind was in evidence, and Langford quickly built up an unassailable lead in the second. Even so there was good work from midfielders Sean Woodhouse, Dominic Ryan and Mason Ashby, with front men Will Juster and Aaron Gauntlett maintaining a goal threat. After 23 minutes French took her chance well after some good link play with Elsa Kirkwood and the Lions were one up. Only three minutes later, Megan Viljoen went on another strong run and after beating three players slotted the ball in. The defence of Katy Thiel, Emily Hodson and Eden Scott coped easily with everything that came into the Lions half. At half time it was 2-0 to EB Lions. The second half started of the same as the first had finished with the Lions attacking strongly and with only a minute gone French got her second after a good through ball from Ashby. A further five minutes saw GOM French score her third with a great header from a corner to complete a great hat trick. Then with only a minute remaining Ashby scored a fantastic goal with an overhead kick and the birthday girl finished off a great match. Team: Oliver, Thiel, Hodson, Scott, Ashby, French, Edwards, Ferguson, Viljoen, Kirkwood, Byrne. Goals: French 3, Ashby, Viljoen. Out to better their impressive performance last week, Lions faced the formidable Kestrels in what would always be a challenging encounter. Forced into a sequence of outstanding saves, MOM Cameron Burchell excelled to foil the majority of Crawley's marksmanship. Even so the visitors finished the first half with a five-goal lead. Lions began to link up in the second, defenders James Glover and Joe Thorne closing in to neutralise a ferocious Crawley onslaught. Strong passing plays between midfielders Myles Frederick, Sam Carter and Sam Bramston and forwards Joe Rabey and Toby McGee opened the door on a handful of strike opportunities. Ten minutes into the half, Joe broke free to find Toby who loosed a searing shot, clawing one back for the hosts. Minutes later Joe lashed in from 15 yards and Lions seemed to be on the comeback trail. Crawley refused to be turned over, though and managed a sixth, leaving Lions insufficient time to continue their impressive fight back. It was good to see the Lions doing what they do best and that's giving 100 per cent from the first kick to the last. The Lions got off to a great start and after nine minutes they went ahead with a fine goal from Megan Viljoen (who was awarded GOM) after some great linkup play with Darcy Ashby pushing forward from midfield. The Lions continued to dominate from midfield with Ashby, Hattie French, Emily Edwards and Devon Ferguson giving some great service to Viljoen, Elsa Kirkwood and Shannon Byrne up front. Then, with 20 minutes gone, Viljoen got her second and the first half ended 2-0. The Lions defence of Katy Thiel, Eden Scott and Emily Hodson were solid all match which meant keeper Nancy Oliver had little to do. The game ended 2-0 but could have ended with a much larger goal difference had the Lions put away more chances. This was a great team effort with everyone playing their part. Having played Edlesborough CC 2 weeks ago for the Ted Bowers Cup, it was discovered after the game (which the Bray won) that the Cup was nowhere to be found. In a surprise turn of events the Ted Bowers Cup has been found by Paul "Chopper" Harris after a spot of cleaning, it is assumed that it was discovered on the Harris's mantlepiece where it had pride of place next to Chopper's gold medal for winning the U9s Egg & Spoon race whilst he was at school in 1965. Once removed from the mantlepiece (if possible), where it is beleived to have resided since Chopper was skipper of the victorious Bray team of 1982, it shall pollished and presented to Josh Peacock, the 2009 skipper, at the Annual Presentation Night. It was the turn of Great Gaddesden to visit fortress Rye Gardens on Sunday and with skipper Josh Peacock taking a punch to the throat in a Sunday morning footy game, strangely things were quiet! Unfortuneately the want to bat first with the depth and batsmen at his disposal did not come off as opposition skipper Cheese-Man (jnr) won the toss and opted to send his troops out to bat, while the Bray were forced to trudge out onto the field. James Flecknall and Joe Roff opened the bowling with Flecknall taking a liking to bowling with a new shiny cherry and went for the "if you can't get em' out knock em' out" tactic, frequently putting the ball round the opposition batsmen's ears. Birthday girl Georgie Coughtrey (now 87) bowled with accuracy and even though we are starting to realising that age is affecting his Shaun Tait-like bowling action, he still has got it... (being the tufts of hair on his head). Anyway, Barm managed to get a 4-for and didn't buy a jug for evading 5, bowling with big time F+G throughout his spell, finishing with figures of 8-1-39-4 with help from 1st team skipper Norris who added some tidy Chris Clarkey like glovework. Peacock senior, fresh from his involvement in protecting his little brother earlier in the day, during Sunday morning's fracas, bowled towards the end and being unlucky not to pick up a few wickets. Kerins bowled 6 overs for 46 near the end (somehow I think he got some of Barms runs) and Jake truly finished things off in style by going for 35 in 3 overs. NICE! Great Gaddesden ended on 248 with Crawley 98* and Oliver 41 ret. being the main contributors. Skipper Peacock and the Roff went out to open the innings and Peacock very much took a liking to the buffet Barm style bowling on offer and proceeded to smash 39 before being caught behind off opposite number Cheeseman. Jimbo hit a quickfire 25 before being stumped. Andy, managing to see straight in stark contrast to the night before (This guy's got some moves) also did his bit with the bat too hitting 51, forging a strong partnership with Kerins who added 29 to give the innings some impetus. However, when the pair were lost and with the run rate increasing it would be a big ask of the lower order to give it a go, and it wasn't helped by numbers 7 Harris, 8 Coughtrey (who hasn't seen straight for years now) and 9 Barker falling for ducks. Barm and Ryan gave it a good go at 10 and 11 adding 17 and 10 n.o respectively before Jones mowed the grass and was bowled. Bray ending 50 runs short on 198. The Bray boys arrived to an amazing piece of good fortune. Due to an earlier football related 'incident', skipper Josh Peacock had lost his voice and was unable to speak for the whole day! A game of cricket with him involved has never been so quiet!!! Losing the toss again he was duly asked to field on a warm September day. Mixed bowling from openers Roff and Flecknell got Gaddesden off to a good start. 1st change Coughtrey, had to leave the field when attempting a caught and bowled and whilst he missed 1 over, Bray removed both openers. 1 genuine wicket and 1 retired hurt! Runs were still flowing aplenty, despite Jones' 4 wickets which included 2 stumpings and a catch for keeper Norris. Quite who was giving the instructions throughout the day was unclear, but the person next to skipper Peacock at any particular time had to be vocal. Death bowlers Barker and Kerins were given some treatment as the visitors racked up an impressive 248-4 off 40 overs (yes Jones did get all the wickets but he's probably text you and told you this before you've got around to reading this). Despite this, Barker was still first in the queue for tea. Openers Roff and Peacock got Bray off to a decent start, but when both fell in quick succession, it was hoped Flecknell and Norris could make big inroads into the huge total. It was all going so well until Flecknell needlessly got himself out stumped and when McDermid fell next ball, drinks had to be taken as next batsman Kerins was the umpire!! Needing 160 odd off 20 overs, Norris and Kerins put on 72 and gave the Bray real hope before Norris allowed a long hop to creep up his bat through to the keeper and Kerins was caught in the deep by a diving 70 year old! Some hitting from last pair Jones and Peacock snr ensured Bray got up to a respectable 194 all out with 1 over to go. Short of cash, Jake Barker, renowned for his tea eating was then offered a challenge. Several members would put up some cash if he could eat a large bowl of salad (he has never before eaten anything good for him). This challenge was readily accepted and he said it would be easy. 1 hour later, and after several false attempts to puke, he finally succeeded. Munching on a Mars bar 'to take away the taste' he quoted "he'd rather run 20 miles than do that again!" The next Parish Council meeting to be held at the Coffee Tavern on Monday 5th October 2009 at 7.30pm. 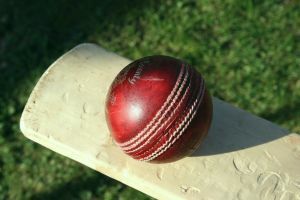 As the season nears an end close rivals William Simmons were entertained at Rye Gardens as the Sunday XI made it 2 wins in two with some good performances in all areas. Bray lost the toss, and were put in on a fairly decent looking pitch for this time of the year, (jumpers and triple layers were visible as the day wore on.) Bray made a solid start with openers Ollie Wilson and James Flecknall putting on 59 for the first wicket before Wilson was out for 18. This continued with captain Peacock and Flecknall carrying on the onslaught, a huge total looked very likely, until Peacock was out for 33, the pair putting on 92 in 10 overs. James carried on whacking the ball to all parts until he was out for a very classy and dominant 97. With a useful 19 from Jason Mcdermid, 31 n.o from Manny Barker and 14 from Joe Roff, Bray closed on a very respectable 231-9. In reply Simmons struggled against opening bowlers Roff and Mike Smith with the latter keeping his lines tight whilst bowling with good pace. Bray took wickets fairly regularly with only Deverell (32) and Gear (30) hitting a few lusty blows as well as opposition skipper Ashcroft (71) down the order. The Ashcroft wicket was a big coup for the lads as he took liking to some of the bowlers, with Joe Roff possibly claiming catch of the season off the bowling of E. Barker as he ran round from the boundary before sliding as he took an amazing catch in the fading light. Just a quick mention to Ollie Wilson who fielded absolutely awfully and looked like Barm at extra cover instead of his usual athletic self. like Skipper Peacock gave many of his side a go with the ball with debutant youngster Jonathan Harris chipping in with 2 overs for just 10 runs. Simmons ended up batting in near blackness and closing the innings 13 runs short on 218-9. Roff finished up with figures of 8-0-42-2, Mike Smith 8-0-37-1, Manny Barker 5.2-0-30-2, Ian Jones 4-0-18-1, Jake 5-0-28-1, Harv 4-0-28-1, Little Jonathan 2-0-10-0, and Jimbo adding a bit of squeeze at the end with 3-0-12-0. Bring on next week as Bray look to field a strong side once more and hope to close out the season with a couple of wins which is more than our young side (with the help of a few 'oldies') deserve. Lions kicked off their season debut with the same resolve they had displayed at the end of the last, creating a sequence of strike opportunities. Forwards Joe Rabey and MOM Toby McGee linked up to pour on goal threats and within 10 minutes a neat through ball found Toby who netted. Colts fought back and, foiled by textbook defensive work from James Glover and Joe Thorne, were initially frustrated in their attacking plays. Expert keeping from Cameron Burchill put paid to three on-target strikes before two landed in quick succession, handing Colts a sudden lead. The opening half ended with some dominating play and searing shots from the visitors, who looked to open the second with a statement of intent. Midfielders Sam Bramston and Sam Carter began working the length of the pitch to frustrate the home team and hog possession, but Colts bit back, scoring a third on the rebound. Stubbornly maintaining their new-found clinical form, Lions patiently worked the Colts' back line until finally Joe Rabey slammed home to go 2-3. The home side countered once again as another goal slipped in. Refusing to capitulate, Lions increased the pressure with a stunning through-ball from Sam Carter to Toby McGee, who netted for his second goal of the match. Colts struck twice more before the final whistle to end a display which bodes well for both teams. Lions began their season with a promising display of dominance over 11-a-side newcomers Luton Old Boys Youth. Forwards Sean Woodhouse and James Hurley teamed up well to maintain a goal threat and at the opposite end, outstanding defensive work from MOM Tom Horner and Aarin Johnson, and strong saves from Dan Kennell, held the visitors at bay. Following a goalmouth scramble, Luton opened the scoring in what had been an even match, but Lions pushed back with aggressive passing moves from midfielders Chris McGee, Charlie Nevin and Dominic Ryan. A stunning run from Will Juster and Charlie almost resulted in a well-deserved equaliser before the break but, starting the second half strongly, Luton began to find their momentum. Midfielders Adam Bradley and Mason Ashby kept up some intelligent pass work and Ben Roberts continued to pull off his trademark smashes to clear the defensive line. Even so Luton managed to score five more in quick succession. Another two followed shortly after and Lions were beginning to dissolve. Strong reinforcement came from Jake Draper and Alex Poynter and Aaron Gauntlett, while a searing cross from new player James Hurley to Charlie suggested the home side were not ready to capitulate. Even so the final scoreline was disappointingly lopsided. The Bray took on local rivals Edlesborough on Sunday for the Ted Bowers Cup (who was a long-time stalwart of both clubs), unfortunately the Cup's whereabouts is unknown so wasn't actually presented!! A fairly strong Bray side was assembled for this annual clash, with the inclusion of a couple of senior 1st teamers strengthening the usual compliment of Sunday regulars. 1st teamer and Sunday captain Peacock again won the toss and decided to make first use of a decent looking Boro pitch. Thing began badly for the Bray when the mobile scoreboard tipped over in a gust of wind and struck skipper Peacock on the head. Whilst the skipper received some attention from nurse Coughtrey the scoreboard will need to be replaced next year. Bray fortunes then dropped even further in the 2nd over when Ollie Wilson was run out for a Diamond Duck (out without facing a ball) for the second time this season, looking for an improbable 3rd. The rest of the Bray's innings consisted of lots of decent cameos, Chop 41, Flecknell jnr 36, a concussed 36 from the skipper and a very impressive 38 from 14 year old Charlie Tickell. Eventually the Bray finishing on 169-9 after their 40 overs. All batsmen struggling on the pitch which hardly bounced, belying its look earlier on. The introduction of young Charlie Tickell, Jake Barker and Zak Churchyard finished off the overs with Edlesborough limping to 120ish for 7. With Charlie taking 2 wickets to claim the Man of the Match Award. A number of players from both teams were still seen socialising in the Bell at nearly midnight, showing the camadarie between these two teams. Its hoped that Edlesborough CC continue as a cricket club for many years to come to allow plenty more days an evenings like this. Barm try getting the facts right before writing the report!! Ask for the scorebook in future, or as agreed allow me!! That's also the first toss I have won in weeks! The Five Bells pub in Eaton Bray has been sold to new owners. Included in the sale is a 0.54 acre plot of land and a detached property with an adjoining function room. There is also a lawned trade garden and car parking for 18 vehicles. Inside there is a snug bad, main bar with pool table and games area, kitchen and three-bedroomed accommodation. Andy Fridby of Fleurets London office said: "The Five Bells attracted a great deal of interest". On behalf of the 10 o'clock Club I have been asked to say a special thank you to the many village folk who supported their Coffee Morning when £180-00 was raised for their special charities. Despite the changeable weather on the day, our Cream Teas were well supported and a cheque for £1000-00 has been sent to the Gaza Appeal. This was a real Fun event enjoyed by all ages; thanks go to Jane, James and Nikki McFarland for all their hard work and excellent organisation and to all the members who helped tirelessly before, during and afterwards. Our Harvest Celebrations begin with a Special Charity Concert in our Chapel on Saturday 26th September at 7pm which will feature” Pasque Harmony”. The proceeds from the concert are to benefit The Keech Cottage Children's Hospice and tickets are available from Graham Carter on 01525 220742 at a cost of £6.00. This promises to be a very special evening and is an excellent way to support this Children's Hospice. A warm welcome awaits. The Harvest Festival Family Service will be on Sunday 27th September at 10.30am. Once again all tins and dried gifts will be given to Crombie House in Leighton Buzzard and donations given for the fresh produce. Following the success of last year we are to have a Harvest Lunch at 12.30pm on the Sunday and tickets will be available from Graham Carter on 01525 220742 from the 1st of September. With half the team severely struggling following a sizeable party the night before the Bray took on Studham on Sunday, on a cold and blustery day. Winning the toss and electing to field first the Bray spent 40 overs chasing red leather. Studham batting very well to reach 240-7. Though a late order collapse after fine bowling from Charlie Tickell, Ryan Shilleto and Ryan Peacock restricted the scoring in the last 10 overs. The Bray then set about the task of chasing down this daunting total, with only Josh and Brian the recognisable batsmen and Brian the only one with his eyes open. Josh Peacock and Joe Roff started things off, progressing steadily before Joe was out with the score on 31. The number 3 batsman was preparing himself for the task ahead by falling asleep!! Considering what happened next, this preparation technique is highly recommended!! At the fall of Roff the sleepy no3 ambled out to the middle and proceeded to make the Studham attack look world class, failing to hit the ball off the square for large portions of his knock. However, with Peacock smacking regular 4s the score built quite nicely. Eventually, our sleepy No3 was out with 7 overs remaining, having been in 2nd wicket partnership of 132 contributing 20 of these, having been in for 25 overs! A middle order collapse subsequently followed whilst our No3 went back to sleep and our skipper continued to plunder runs and send Studham's attack to all parts!! The skipper (Josh Peacock) remained standing and was still not out at the end of the match eventually racking up 158*, finishing his innings batting with older brother Ryan who was 6* off 2 balls. His first ever hundred and smashing the record for the highest score by a Bray batsman at the Rye Gardens (beating the 119* scored by Dk the week before). This guy is starting to develop into one bloody good batsman, promising signs for the sterner challenges he faces in the league. The bray still found themselves 20 runs short, but this was a valiant display by the team, full of youngsters and some very promising young cricketers. And some very sozzled older players!! You are viewing the September 2009 archive.